Once known for petty crime and drugs, the now-popular Brewer Plaza was renovated and opened last summer. The corner of Park and Tremont Streets is the crossroads of the city, where thousands pass through daily, visiting the State House, taking the T, or just soaking up America’s first public park, the aptly-named Boston Common. But until recently it was no place to linger for all but the toughest characters. The area around the Park Street MBTA station had become known for petty crime, drugs, and homelessness. A special committee of the Boston City Council in 2008 used words like “ill-conceived” and “poorly maintained” to describe visitor facilities, and bluntly called the defunct Brewer Fountain nearby “an eyesore.” It was an area “people shunned because it wasn’t a comfortable place to be in,” said Elizabeth Vizza, director of the nonprofit Friends of the Public Garden. Jarred by a curfew Boston police imposed on the Common to reduce crime in 2007, the Friends and the city Parks and Recreation Department got to work reclaiming this key part of Boston’s urban fabric. 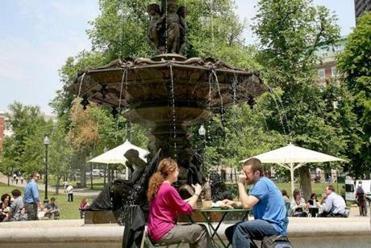 The city secured a $200,000 preservation grant to restore the 1855 bronze fountain, dry since 2003, to its gushy glory. The Friends improved landscaping and lighting, and removed cement barriers that made the area look like an armed camp. The fountain was restored with a $200,000 preservation grant. Then the advocates turned to Biederman Redevelopment Ventures, managers of the privately-run Bryant Park in New York City (itself redeemed from its reputation as “Needle Park” in the 1980s). They programmed the area with live piano music, board games, and food vendors, and tried to attract corporate donations to supplement dwindling public funds. The renovated plaza opened last summer, and today, visitors are flocking to what Vizza calls the “outdoor living room” near the fountain. Another seemingly-obvious step was to introduce moveable furniture. If visitors can decide themselves whom to sit near, or whether to be in sun or shade, they’ll feel more in control of their surroundings, and therefore safer. This simple gesture toward making the plaza more inviting had been avoided for fear that the café furniture would be stolen. It hasn’t happened. 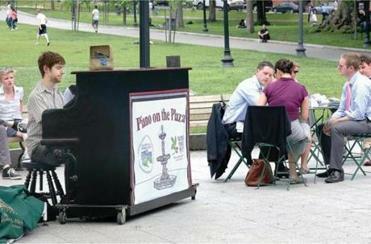 Lunchtime entertainment can be had with the solar-powered piano. The Brewer Plaza Fountain Project is the most ambitious project the 40-year-old Friends of the Public Garden has ever undertaken; it’s a $4 million investment, all told. It’s also the most substantial operation the Parks Department has ever ceded to a private group. It’s a tentative step toward the kind of public-private partnerships that other cities, like Dallas or New York, take for granted. Still, everyone is clear that Bryant Park, for all its success, isn’t the model for Boston. “Privatization will never work here,” said Parks Commissioner Antonia Pollak. “This is the most democratic space in America. We will never give that up, ever.” Biederman’s contract with the Friends ended last July, several months after the successful plaza reopening. 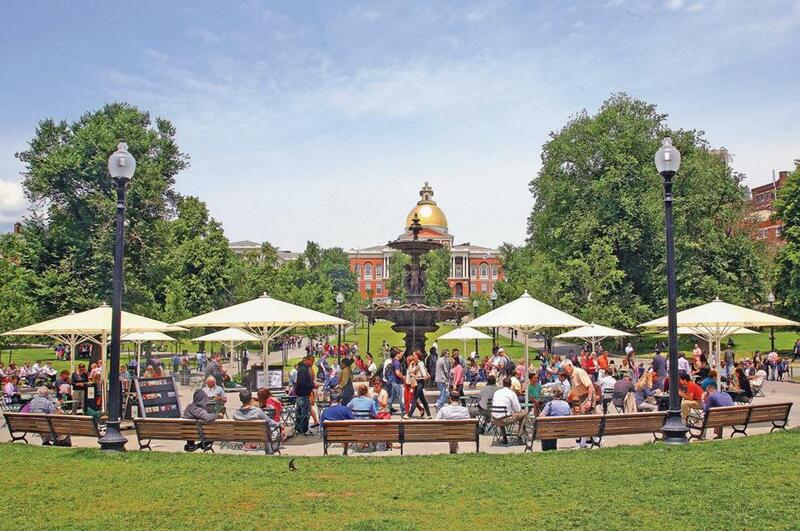 That leaves the Friends to seek $850,000 in private donations for the next phase of restoration, which will include new iron fencing and landscaping along Tremont Street, a more attractive café kiosk, and continued programming. The Friends employ a plumber who maintains the fountain’s inner workings, and a conservator to look after the sculpture. On a recent sunny weekday, a Berklee School of Music student was playing “Stompin’ at the Savoy’’ on the retrofitted, solar-powered outdoor piano. Every seat in the shade was taken. Couples and young families posed for photos in front of the murmuring fountain. There was a line for the chickpea sandwiches at the Clover Lab food truck. And even though a rowdy group of men and one woman was sitting nearby, shoving each other and shouting obscenities, they didn’t deter the rest of the happy crowd. They were obnoxious and maybe a little scary, but they were outnumbered.